Approaching the well-sharpened sword without cowardice. Saint Peter came from the city of Capitolias, an ancient city east of the Jordan River identified with the modern village of Beit Ras in northern Jordan, which at that time belonged to the Diocese of Damascus. He was married with three sons and was highly regarded for his wisdom and his good sense. At the age of thirty he along with his family entered the monastic life. Against his will he was honored with the office of the priesthood by the Bishop of Bostra. When he was sixty, he became seriously ill and, fearing lest the blessing of martyrdom escape him, he called together some eminent Muslims, ostensibly to give them charge of his last will and testament, but really to make an ardent confession of the Christian faith, that ended in a vehement rebuke and denunciation of Islam and Muhammad. Against all expectation, Peter recovered from his illness and, desiring all the more to share in the glory of the Martyrs, he began to insult the error of the Muslims in the streets and squares of the city. He was soon denounced to the authorities and arrested, then taken to Damascus to appear before Caliph Walid (705-715). The Christians of Capitolias, seeing their beloved priest taken away, assembled and accompanied him part of the way. His fiery response to the Caliph's questions left no doubt of his desire for martyrdom. In sentencing him, the judge appointed a long and extremely cruel execution. On 10 January 715, the Holy Martyr was taken back to Capitolias, and there he was made a spectacle of the people, especially to his children, who were taken out of their monastic cells that they had lived in since childhood, and they were placed in the first row of spectators. 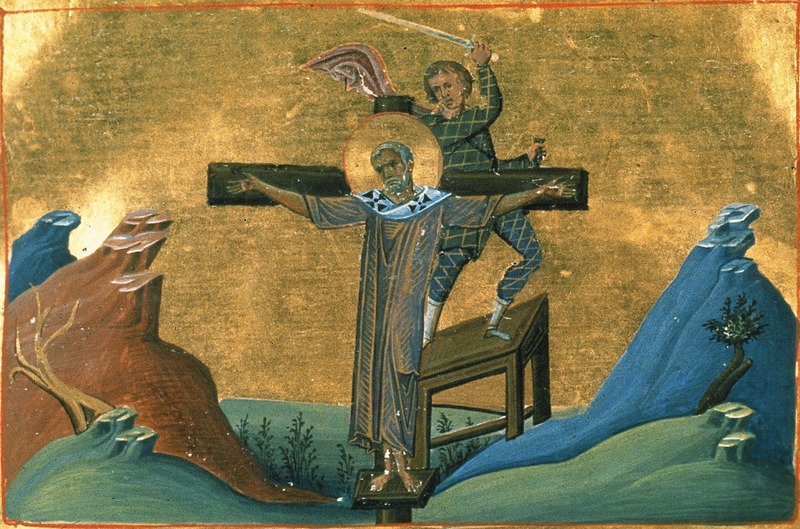 The executioner first tore out the Saint's tongue at its root; the next day he cut off a hand and a foot; and on Sunday, in the presence of yet a greater crowd, the remaining hand and foot of the Martyr were cut off. After this he was blinded and crucified, where he was pierced three times with a spear and subsequently died. Soldiers kept watch over his body for five days and then burnt it, throwing his ashes into a nearby river, and even took care to wash everything that may have touched his holy relics so as to prevent the faithful from venerating it. His life is believed to have been recorded by Saint John of Damascus, but the original Greek life is lost and it exists only in a Georgian manuscript.